The US posted the lowest trade deficit in 18 months driven by increases in exports and declines in imports, particularly due to lower oil prices. WSJ: - The U.S. trade deficit with other countries narrowed to $42.9 billion in June from $48 billion a month earlier, the Commerce Department said Thursday, as imports fell and exports grew. Exports, which have been a pivotal contributor to the economic recovery, were strong almost everywhere except to Europe, where a recession and a protracted sovereign-debt crisis have sapped demand. Europe's lackluster appetite for U.S. goods was more than countered by countries such as China, where reliance on U.S. exports continues to expand, even as that economy has slowed from double-digit growth. In June, the U.S. notched increases in exports of a variety of goods including pharmaceuticals, cars and industrial engines. Exports increased $1.7 billion to $185 billion, the highest monthly tally ever. Imports declined $3.5 billion to $227.9 billion, driven largely by a drop in oil prices that reduced the value of petroleum imports. 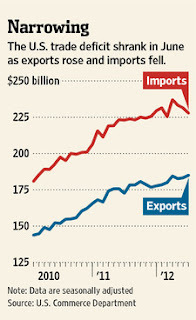 Total U.S. exports are up 6% in the first six months of 2012 from the same period a year ago. 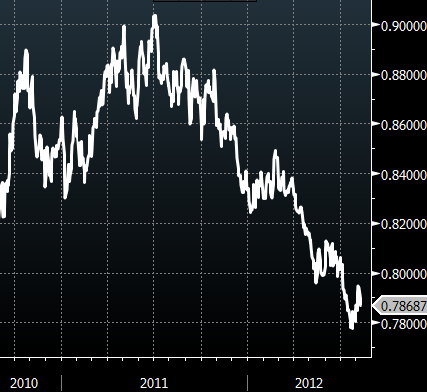 In the first half of 2011, they were up 16% from the year-earlier period. This improvement was unexpected and is likely unsustainable given broad weakness across emerging markets countries. Nevertheless the US was helped by a diversified portfolio of export markets. 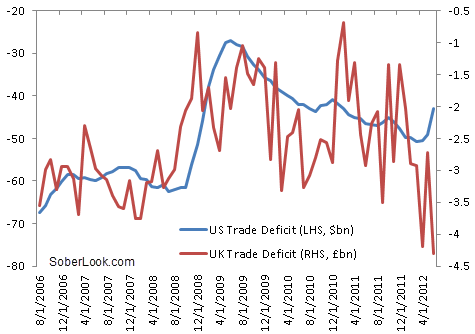 On the other hand the UK posted the worst trade deficit in at least 15 years. WSJ: - The U.K.posted its largest overall trade deficit since comparable records began 15 years ago, indicating that weak demand for British goods, in Europe and beyond, is hampering the country's efforts to trade its way out of recession. The U.K.'s world goods trade deficit—which, with the services trade balance, makes up the overall trade balance—widened more than expected to £10.1 billion ($15.82 billion) in June from £8.4 billion in May, the biggest deficit since September 2011, figures from the Office for National Statistics showed Thursday. The explanation has to do (at least in large part) with the UK's dependence on the Eurozone for exports, which is not as pronounced for the US. The Telegraph: - The trade in goods deficit jumped to a record £10.1bn in June from £8.4bn in May after the eurozone crisis drove an 8.4pc fall in exports. 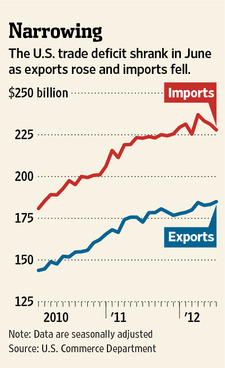 The collapse in exports far outpaced a 1.2pc fall in imports, the Office for National Statistics said. What is making it particularly difficult for the UK is the strength of the British pound versus the euro (discussed here) - as UK goods look relatively expensive in the Eurozone. This sharp divergence between the US and the UK trade balance numbers (chart below) is yet another example of the the impact the Eurozone is having on global economies.